Wow, it was a bit of a Take-it-off and Put-it-on run last night. 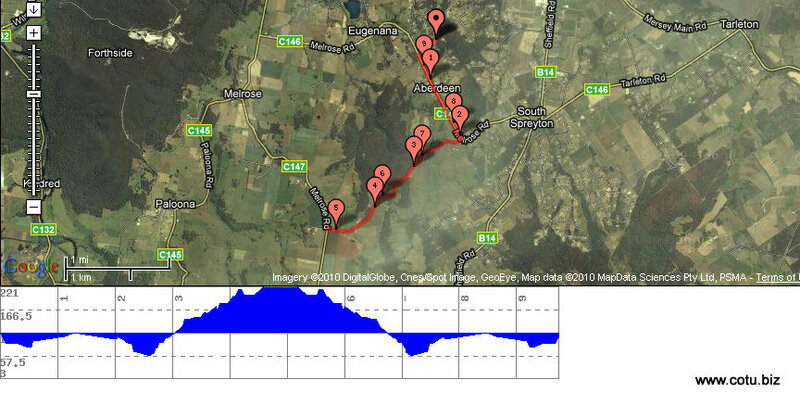 The runners were directed 5km straight up to the top of Busters Road (165 meters higher than the lowest point of the run) and the walkers were deposited into a paddock from where the true believers used their GPS enabled toys to get them lost. The sensible pikers, the SCBs, did not cross the grate into the paddocks and followed their noses home to the gourmet platter that was ready to be served. For better map click here: www.gmap-pedometer.com. Next run is Captain Crab's from Ottos Grotto on Wharf Road, Ulverstone.